Many studies of school achievement find a significant association between reading and arithmetic achievement. The magnitude of the association varies widely across the studies, but the sources of this variation have not been identified. 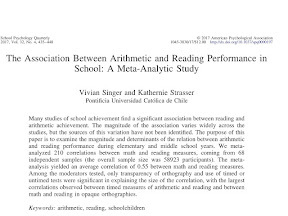 The purpose of this paper is to examine the magnitude and determinants of the relation between arithmetic and reading performance during elementary and middle school years. We meta-analyzed 210 correlations between math and reading measures, coming from 68 independent samples (the overall sample size was 58923 participants). The meta-analysis yielded an average correlation of 0.55 between math and reading measures. Among the moderators tested, only transparency of orthography and use of timed or untimed tests were significant in explaining the size of the correlation, with the largest correlations observed between timed measures of arithmetic and reading and between math and reading in opaque orthographies.